Escherichia coli has two L-cysteine biosynthetic pathways; one is synthesized from O-acetyl L-serine (OAS) and sulfate by L-cysteine synthase (CysK), and another is produced via S-sulfocysteine (SSC) from OAS and thiosulfate by SSC synthase (CysM). SSC is converted into L-cysteine and sulfite by an uncharacterized reaction. As thioredoxins (Trx1 and Trx2) and glutaredoxins (Grx1, Grx2, Grx3, Grx4, and NrdH) are known as reductases of peptidyl disulfides, overexpression of such reductases might be a good way for improving L-cysteine production to accelerate the reduction of SSC in E. coli. Because the redox enzymes can reduce the disulfide that forms on proteins, we first tested whether these enzymes catalyze the reduction of SSC to L-cysteine. All His-tagged recombinant enzymes, except for Grx4, efficiently convert SSC into L-cysteine in vitro. Overexpression of Grx1 and NrdH enhanced a 15-40% increase in the E. coli L-cysteine production. On the other hand, disruption of the cysM gene cancelled the effect caused by the overexpression of Grx1 and NrdH, suggesting that its improvement was due to the efficient reduction of SSC under the fermentative conditions. Moreover, L-cysteine production in knockout mutants of the sulfite reductase genes (ΔcysI and ΔcysJ) and the L-cysteine synthase gene (ΔcysK) each decreased to about 50% of that in the wild-type strain. Interestingly, there was no significant difference in L-cysteine production between wild-type strain and gene deletion mutant of the upstream pathway of sulfite (ΔcysC or ΔcysH). These results indicate that sulfite generated from the SSC reduction is available as the sulfur source to produce additional L-cysteine molecule. It was finally found that in the E. coli L-cysteine producer that co-overexpress glutaredoxin (NrdH), sulfite reductase (CysI), and L-cysteine synthase (CysK), there was the highest amount of L-cysteine produced per cell. In this work, we showed that Grx1 and NrdH reduce SSC to L-cysteine, and the generated sulfite is then utilized as the sulfur source to produce additional L-cysteine molecule through the sulfate pathway in E. coli. 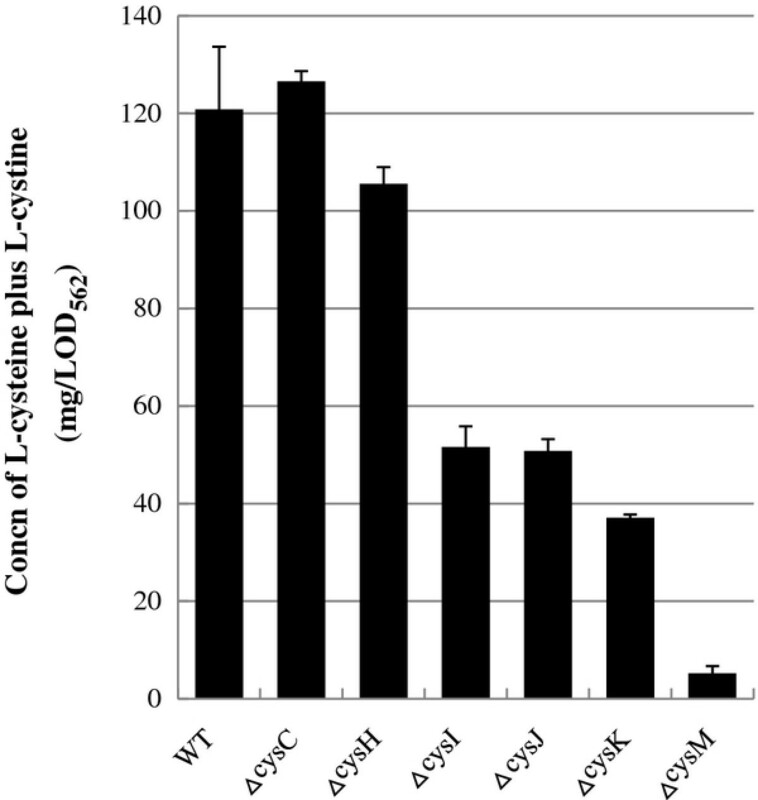 We also found that co-overexpression of NrdH, CysI, and CysK increases L-cysteine production. Our results propose that the enhancement of thioredoxin/glutaredoxin-mediated L-cysteine synthesis from SSC is a novel method for improvement of L-cysteine production. L-Cysteine is the most important sulfur-containing organic compound, and it is required for the biosynthesis of sulfur-containing compounds such as l-methionine, thiamine, biotin, and coenzymes A. In addition, L-cysteine plays crucial roles in protein folding, assembly, and stability through disulfide-bond formation. L-Cysteine-containing proteins, such as thioredoxin (Trx) and glutaredoxin (Grx), are involved in protecting cells under oxidative stress conditions. Recently, we have proposed that the periplasmic L-cysteine protects E. coli cells from hydrogen peroxide, which is produced by phagocytes, in the environment. Since L-cysteine has the essential functions in cellular metabolism, it is also an important amino acid in terms of its applications in the pharmaceutical, food, and cosmetic industries. Because high levels of L-cysteine have been reported to be toxic to cells[2, 3], intracellular L-cysteine level is strictly controlled. Excess L-cysteine inhibits the activity of L-serine O-acetyltransferase (SAT), a key enzyme in the L-cysteine biosynthetic pathway (Figure1). We have so far constructed recombinant E. coli strain that overproduces L-cysteine/L-cystine by expressing feedback inhibition-insensitive SAT. The L-cysteine production has been also improved by disrupting L-cysteine desulfhydrases (CD). Five different CDs (MetC, MalY, CysK, CysM, and TnaA), which degrade to pyruvate, ammonia, and sulfide from L-cysteine, have been characterized in E. coli. In addition, overexpression of L-cysteine exporters (YdeD, YfiK, Bcr, and TolC) significantly increased L-cysteine production, probably due to the decrease in cellular L-cysteine level[7–9]. For further improvements in L-cysteine production, one can consider enhancement of the downstream pathway of SAT, which includes incorporation of sulfur into OAS. Sulfur assimilation and L-cysteine synthetic pathway in Escherichia coli. 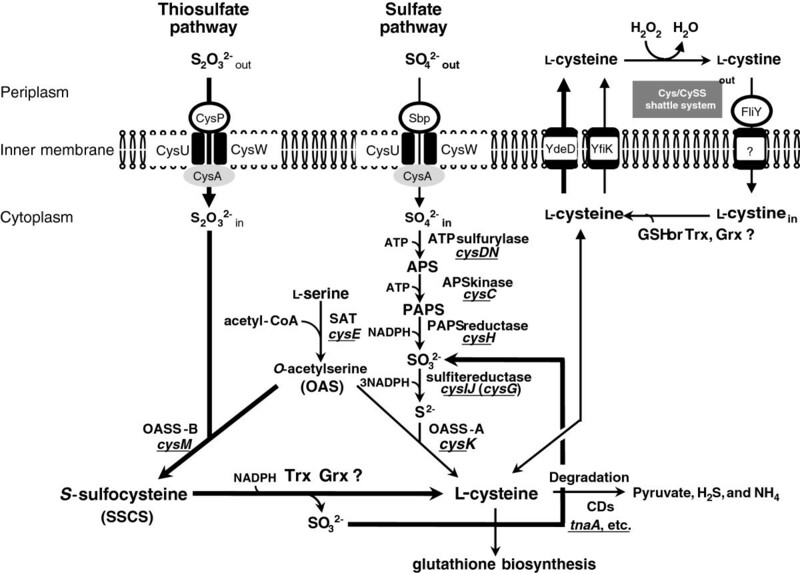 E. coli has sulfate pathway and thiosulfate pathway for L-cysteine synthesis. Proteins and genes involved in assimilation of inorganic sulfur sources in E. coli are shown. APS, adenosine 5-phosphosulfate; PAPS, 3-phosphoadenosine 5-phosphosulfate; OAS, O-acetylserine; GSG, glutathione. In Gram-negative bacteria, E. coli and Salmonella typhimurium, the sulfate-thiosulfate permease is a complex of five types of subunits encoded by: sbp, cysP, cysU, cysW, and cysA genes. Sulfate assimilation is initiated by periplasmic sulfate (Sbp) and thiosulfate (CysP) binding proteins. E. coli has two enzymes which assimilate inorganic sulfur sources, CysK and CysM. While the former enzyme utilizes sulfide (S2-) as a sulfur donor, the latter enzyme uses thiosulfate (SSO32-). CysK synthesizes L-cysteine from O-acetylserine (OAS) and sulfide, but the CysM protein differs in that it can also utilize thiosulfate instead of sulfide (Figure1). The product formed by the CysM activity, S-sulfocysteine (SSC), is converted into L-cysteine and sulfite by an uncharacterized reaction. Sulfite is an intermediate of the sulfate pathway. The E. coli sulfite reductase consists of the alpha subunit protein (the cysJ gene product) and the beta subunit protein (the cysI gene product). The sulfate pathway spends two molecules of ATP and four molecules of NADPH as a reducing power to make L-cysteine from sulfate and OAS. On the other hand, the thiosulfate pathway has the advantage that two molecules of L-cysteine can synthesize from a thiosulfate molecule by consuming only one molecule of NADPH. As thioredoxins (Trxs) and glutaredoxins (Grxs) are known as reductases of peptidyl disulfides, we expected that overexpression of these reductases might contribute to improving L-cysteine production by accelerating the reduction of SSC in E. coli. In this study, we identified the reductases involved in the reduction of SSC in the thiosulfate pathway and examined the effect of such reductases on L-cysteine production in E. coli. To eliminate the possibility of reduction of non-enzymatic SSC by GSH, we investigated first about the influence on cystein production by the ΔgshA strain, which cannot produce GSH, in thiosulfate as a sole sulfur source. The ΔgshA of L-cysteine overproducer increased L-cysteine production (Additional file1), suggesting that GSH is not essential for reduceing SSC in vivo. It has been reported that E. coli has two Trxs (Trx1 and Trx2), three Grxs (Grx1, Grx2, and Grx3) and two Grx-like proteins (Grx4 and NrdH). Since the redox enzymes can reduce the disulfide that forms on proteins, we first tested whether these enzymes, catalyze the reduction of SSC to L-cysteine in vitro (Figure2). The His-tagged recombinant protein of each enzyme was purified with a His-trap column as described in the Methods section. The SSC-reducing activity was determined by monitoring the decrease in absorbance of NADPH at 340 nm. The reaction mixture for Trx assay contains NADPH-dependent thioredoxin reductase to reduce Trxs. On the other hand, since the Grx assay mixture contains glutathione (GSH) as well as GSH reductase, the feeble NADPH oxidation activity was detected in the absence of Grx, suggesting that GSH has a weak reduction activity of SSC. However, in the presence of Grx, the activity was significantly increased (Figure2a). Among all redox enzymes, we found that the reducing activities of Grx2, Trx1, and Trx2 were higher than that of other proteins. No activity was observed in Grx4 (Figure2b). It should be noted that L-cysteine, which is a reaction product from SSC, was also detected in the reaction mixture (data not shown). Reduction of SSC to L-cysteine by Trxs and Grxs in vitro. (a) Reducing activity of SSC by Grxs was measured in a reaction mix containing NADPH, GSH, GSH reductase and SSC by monitoring the decrease of NADPH, when adding 10 pmoles of purified Grxs (Grx1-3) for 3 minutes. (b) Reducing activity of SSC by Trxs was measured in a reaction mix containing NADPH, Trx reductase and SSC by monitoring the decrease in absorbance of NADPH at 340 nm for 3 minutes, when adding 10 pmoles of purified Trxs (Trx1-2, NrdH and Grx4). We further examined whether these redox enzymes contribute to improving the L-cysteine productivity. We previously found that there was a significant production of L-cysteine from glucose in E. coli cells carrying the plasmid pDES, which includes the wild-type ydeD gene and the altered genes of cysE and serA. The above E. coli strain harboring pDES was designated as a L-cysteine producer. Growth of the L-cysteine producers overexpressing each redox enzyme was the same level (data not shown). We also determined L-cysteine plus L-cystine level in culture medium of L-cysteine producers (Figure3). 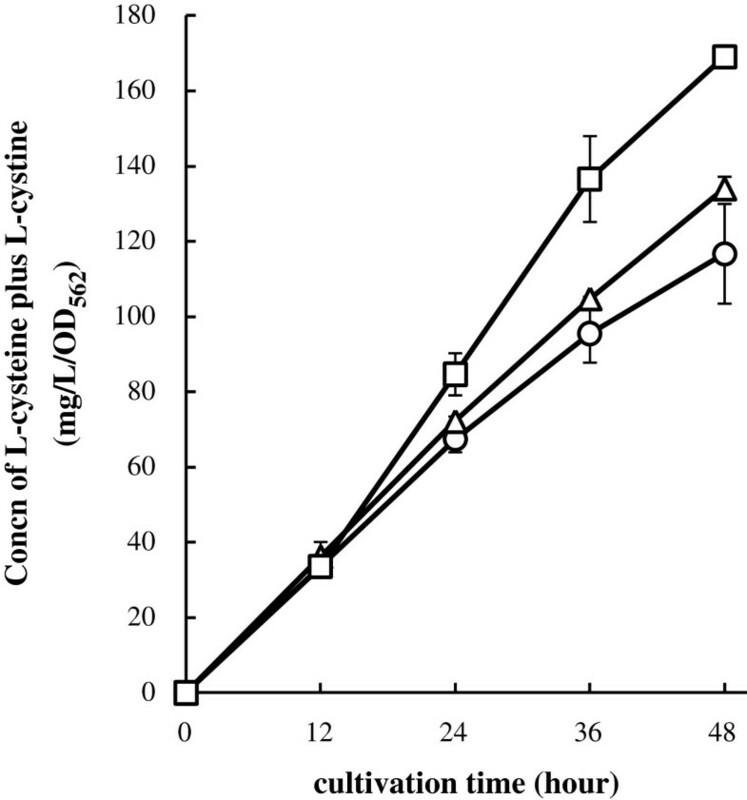 After 48 h of cultivation, L-cysteine producer cells overexpressing Grx1 or NrdH showed a higher amount of L-cysteine than that of cell carrying the empty vector. However, overexpression of Trx1, Trx2, Grx2, and Grx3 did not improve L-cysteine productivity (Additional file2). These results indicate that overexpression of either Grx1 or NrdH is effective for improving the L-cysteine productivity. Improvement of L-cystine production by NrdH or Grx1 in vivo. L-cysteine plus L-cystine production by L-cysteine producer with plasmid overproducing Grx1 or NrdH genes. BW25113 harboring the L-cysteine over producing plasmid pDES (L-cysteine overproducer) was transformed empty vector pCA24N (circles), pGrx1 (triangles) or pNrdH (squares). These strains were cultivated in SM1 medium with 30 mM thiosulfate for 48 hours. The concentration of L-cysteine plus L-cystine was determined by Gaitonde method. Values indicate means and standard deviations of results from three independent experiments. 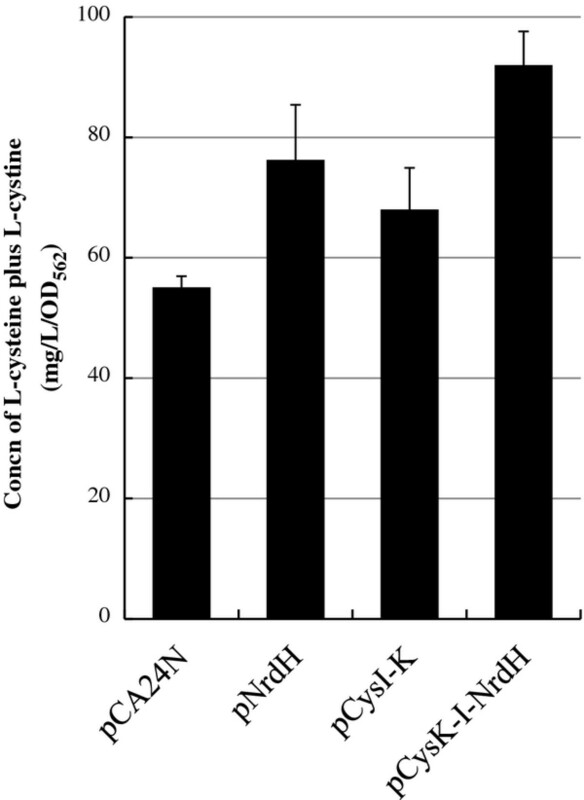 As shown in Figure4, in ΔcysK cells carrying pDES, overexpression of Grx1 or NrdH significantly enhanced L-cysteine production than that of cells carrying the empty vector after 36 h of cultivation. 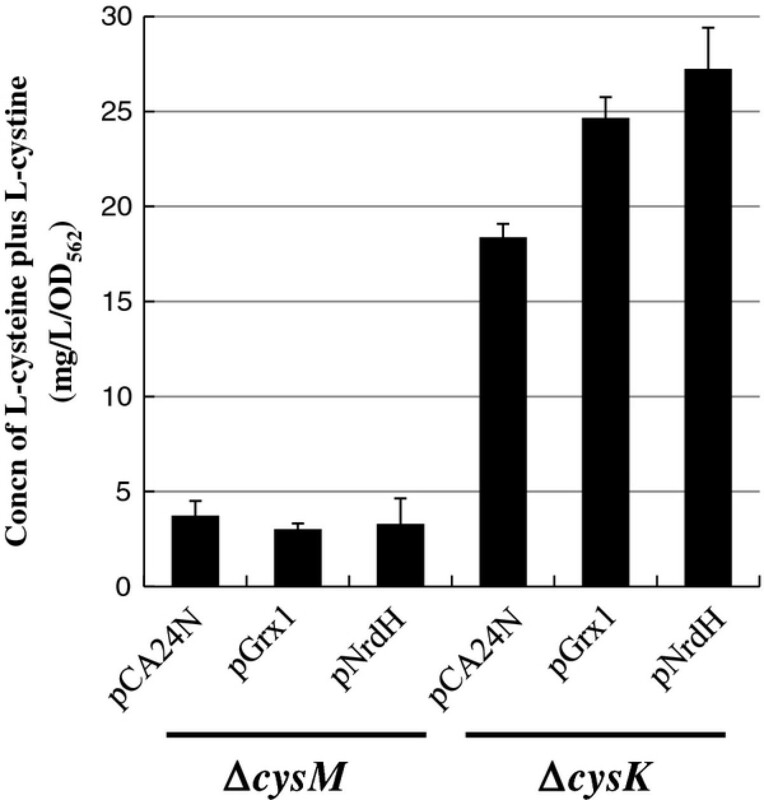 In contrast, when Grx1 or NrdH was overexpressed, there was no significant change in L-cysteine production in ΔcysM cells carrying pDES (Figure4). These results strongly suggest that Grx1 or NrdH is involved in L-cysteine production from SSC, which is synthesized from thiosulfate and OAS by CysM. Furthermore, ΔcysM cells hardly produced L-cysteine even in the presence of sulfate as well as thiosulfate. CysM dependent L-cysteine production. ΔcysM or ΔcysK harboring pDES was transformed plasmids overexpressing empty vector (pCA24N), pGrx1 or pNrdH. These strains were cultivated in SM1 with 30 mM thiosulfate and 30 mM sulfate medium for 36 hours to compare amount of L-cysteine produced from ΔcysM or ΔcysK, respectively. The concentration of L-cysteine plus L-cystine was determined by Gaitonde method. Values indicate means and standard deviations of results from three independent experiments. In addition to L-cysteine, sulfite is produced through the SSC reduction. It appears that sulfite is another sulfur source, as being on intermediate of the sulfate pathway. To address this possibility, we analyzed the effect of lack of the genes involved in the sulfate pathway on L-cysteine production (Figure5). As expected, ΔcysI, ΔcysJ, or ΔcysK cells harboring pDES each showed to about 50% decrease in L-cysteine production compared to that observed in wild-type cells. Interestingly, its yield in ΔcysC or ΔcysH was equivalent the same as that of wild-type cells. These results clearly indicate that overexpression of NrdH or Grx1 in L-cysteine producer converts SSC into L-cysteine and sulfite. It was also shown that generated sulfite is utilized as a sulfur source to produce additional L-cysteine molecule through the sulfate pathway. Incorporation of sulfite generated from SSC reduction into the sulfate pathway to produce another L-cysteine. Wild type, ΔcysC, ΔcysH, ΔcysG, ΔcysI, ΔcysJ, ΔcysK, or ΔcysM harboring pDES were cultivated in SM1 with 30 mM thiosulfate for 36 hours. The concentration of L-cysteine plus L-cystine was determined by Gaitonde method. Values indicate means and standard deviations of results from three independent experiments. The results shown in Figure5 led us to strengthen the reuse of sulfite pathway in L-cysteine synthesis. To improve L-cysteine productivity, we first attempted overexpression of sulfite reductase (CysI and CysJ) or L-cysteine synthase (CysK). The middle-copy-numbered plasmids pCysI, pCysJ, or pCysK was additionally transformed into L-cysteine producer cells. The transformants were cultivated in SM1 medium containing thiosulfate as a sole sulfur source. As shown in Figure6a, overexpression of either CysI, CysJ, or CysK did not lead to an increase production of L-cysteine. Next, we evaluated L-cysteine productivity by co-overexpressing both sulfite reductase and L-cysteine synthase. The L-cysteine productivity in L-cysteine producer cells carrying pCysI-J or pCysJ-K was lower than that of cells harboring pCA24N (Figure6b). On the other hand, overexpression of CysI and CysK increased L-cystine production. Finally, we found that the productivity of L-cysteine producer cells co-overexpressing CysI, CysK, and NrdH was significantly higher than that of cells overexpressing only NrdH or CysI and CysK after 24 h of cultivation (Figure7). In addition to expression of feedback-insensitive SAT, our results concluded that the enhancement of L-cysteine biosynthesis is achieved by (i) utilization of thiosulfate as a sulfur source, (ii) overexpression of SSC reductases, and (iii) acceleration of sulfite reduction. Effect of L-cysteine production by enhancement of the sulfite reductases and/or the L-cysteine synthases. L-cysteine overproducer was transformed (a) empty vector pCA24N (closed circles), pCysI (opened triangles), pCysJ(opened squares), pCysG (opened diamonds) and pCysK (opened circles), (b) pCA24N (closed circles), pCysI-K (opened triangles), pCysJ-K (opened squares) and pCysI-J (opened diamonds) to promote the incorporation of sulfite reduced from SSC to the sulfate pathway. These strains were cultivated in SM1 medium with 30 mM thiosulfate for 36 hours. The concentration of L-cysteine plus L-cystine was determined by Gaitonde method. Values indicate means and standard deviations of results from three independent experiments. Increase in L-cysteine production by the co-overexpression of CysI-CysK-NrdH. These strains were cultivated in SM1 medium with 30 mM thiosulfatens and standard deviations of results from three independent experiments. Escherichia coli has two L-cysteine biosynthetic pathways: one is synthesized from OAS and sulfate by CysK (the sulfate pathway), and the other is synthesized via SSC from OAS and thiosulfate by CysM (the thiosulfate pathway) (Figure1). Indeed, ΔcysM ΔcysK cells exhibited a L-cysteine auxotrophy (Additional file3). The genes involved in L-cysteine biosynthesis and sulfur assimilation in E. coli and Salmonella enterica serovar Typhimurium have been well characterized. However, the conversion of SSC to L-cysteine remained unclear in these organisms. SSC has been believed to non-enzymatically convert into L-cysteine and sulfite by GSH in vivo. However, a defect in the glutathione biosynthesis (ΔgshA) of L-cysteine overproducer increased L-cysteine production, suggesting that GSH is not essential for reduceing SSC in vivo (Additional file1). Therefore, we first focused on redox enzymes of E. coli, especially Trxs and Grxs, to accelerate the reduction of SSC. Our results clearly indicate that recombinant redox enzymes (Trx1, Trx2, Grx1, Grx2, Grx3, and NrdH) reduce SSC to L-cysteine more effectively than a reducing agent such as GSH in vitro (Figure2). Moreover, Grx2 had the highest SSC-reducing activity (Figure2a). This result is consistent with the evidence that Grx2 has higher catalytic activity to a low molecular weight substrate such as HED compared to Grx1 and Grx3. In vivo, on the other hand, overexpression of NrdH or Grx1 is effective for L-cysteine production (Figure3). In fact, the L-cysteine producer/pGrx1 or pNrdH produced about 15% or 45% higher amounts of L-cysteine, respectively, compared to the parental strain (Figure3). Unexpectedly, overexpression of Grx2, Grx3, Trx1, and Trx2 were not effective for L-cysteine production (Additional file2), suggesting that these enzymes might not reduce low molecular disulfides like oxidized glutathione, cystine, and SSC in vivo. It has hardly been reported so far that all redox enzymes except for Grx2 reduce low molecular disulfides in vivo. Moreover, as shown in Figure4, the improvement of L-cysteine productivity by overexpression of Grx1 and NrdH depends on that of CysM. The present report is the first finding to show that Grx1 and NrdH release sulfite from SSC to produce L-cysteine under the fermentative conditions. Next, we challenged acceleration of sulfite utilization. Our results obviously indicate that the sulfite from the reduction of SSC is recruited into the sulfate pathway and is utilized for L-cysteine synthesis under L-cysteine fermentation (Figure5). Consistent with our speculation, the CysI-K and NrdH co-overexpression in L-cysteine overproducer showed the highest L-cysteine productivity (Figures6 and7), suggesting that assimilation of the SSC-mediated sulfite, but not the reduction of SSC, is a rate-limiting step. Since sulfite reductase CysJI forms a complex of CysJ and CysI proteins, the co-overexpression of cysJ, cysI and cysK may be more effective to increase the L-cysteine productivity than that of cysI and cysK. Interestingly, as shown in Figure4 and5, the ΔcysM cells harboring only pDES also hardly produced L-cysteine in the presence of sulfate as well as thiosulfate. This is the first report to indicate that the thiosulfate rather than sulfate is preference sulfur source for L-cysteine fermentation of E. coli. Therefore, E. coli cells might have a regulation system that synthesizes mainly L-cysteine from the energetically-favored thiosulfate, as the assimilation of sulfate spends two molecules of ATP and four molecules of NADPH. We found that SSC (Minimum Inhibitory Concentration value [MIC], 80.5 mg/ml) as well as GSH (MIC, >20.1 mg/ml) is not toxic to cells different from L-cysteine (MIC, 2.2 mg/ml). Thus, SSC might play a role in the L-cysteine pool. It was recently reported that SSC and S-sulfocysteine synthase, which is a homolog of CysM, each play an essential roles in light-dependent redox regulation in plant chloroplasts. Considering the previous and present findings, we suggest that E. coli cells have a regulatory system at the transcriptional level (CysB: activator of genes encoding the sulfate or thiosulfate uptake complex upon sulfur starvation) or at the protein level (CysP: thiosulfate binding protein) to utilize predominantly thiosulfate. Our findings show that the ability of thiosulfate can promote the fermentative production of the other organic sulfur-compounds, such as methionine, GSH, thiamine, taurine, and biotin, which are also commercially needed. Grx1 or NrdH indeed converts SSC into L-cysteine and sulfite in E. coli cells under fermentative conditions. We also provide evidence that sulfite generates by the SSC reduction through the sulfate pathway. In addition, co-overexpression of NrdH, CysI, and CysK increases L-cysteine production. Based on these results, we propose the enhancement of thiosulfate utilization as a novel method for improving L-cysteine production in E. coli. The E. coli strains and plasmids used in this study are listed in Table1. Plasmid pDES (supplied by Ajinomoto) for the overproduction of L-cysteine, which carries tetracyclin resistance gene, is a derivative of pACYC184 containing the altered cysE gene encoding the L-cysteine feedback inhibition-insensitive mutant SAT (Thr167Ala), the wild-type ydeD gene encoding inner membrane L-cysteine transporter, and the altered serA gene encoding the L-serine feedback inhibition-insensitive mutant D-3-phosphoglycerate dehydrogenase (Thr410stop). Each gene fragment is under control of the constitutive promoter of the E. coli ompA gene encoding outer membrane protein A precursor. The altered serA gene is oriented in the same direction, the altered cysE and ydeD genes are in the opposite direction of replication origin, as described previously[9, 19]. To obtain the cysI or cysJ gene, a polymerase chain reaction (PCR) was performed with a set of primers 5’-TTC GTC GCG GCC GC G AAA TCA TAA AAA ATT -3’ and 5’- AAC AAT CCA GAT GAG TTC TGA -3’ (the underlining indicates the position of Not I) with the plasmid pCysI or pCysJ as a template, respectively. These PCR products was digested with Not I and subsequently cloned into pCysK or pCysI to give pCysK-I, pCysK-J, or pCysI-J. In addition, the nrdH gene was also amplified using a set of primers 5’- CGT CTT CAC CTG CGA GAA ATC ATA AAA AAT T -3’ and 5’- TAT CAA CTC GAG TCC AAG CTC AGC TAA TTA -3’(the underlining indicates the position of Xho I) with the plasmid pNrdH as a template. The PCR product was digested with Xho I and then ligated to the plasmid pCysK-I to construct pCysK-I-NrdH. Unless otherwise stated, Lennox (L) broth [1% Bacto Tryptone (Difco Laboratories, Detroit, Mich.), 0.5% Bacto Yeast Extract (Difco), and 0.5% NaCl], Luria-Bertani (LB) medium (1% Bacto Tryptone, 0.5% Bacto Yeast Extract, and 1% NaCl), and SM1 minimal medium (100 mM potassium phosphate buffer [pH 7.0], 150 mM NH4Cl, 1.7 mM NaCl, 1.0 mM MgCl, 0.1 mM CaCl2, 7.2 μM FeSO4, 3.4 mM trisodium citrate, 0.6 μM Na2MoO4, 40.4 μM H3BO3, 2.9 μM CoCl2, 1 μM CuSO4, 8.1 μM MnCl2, 1 μM ZnSO4, and 3.0% glucose (wt/vol) as the carbon source) were used for the general cultivations. If necessary, chloramphenicol (Cm; 30 μg/ml), kanamycin (Km; 50 μg/ml), or/and tetracycline (Tet; 10 μg/ml) was added. For solid media, 1.5% (wt/vol) agar was added. Where indicated, SM1 was supplemented with L broth (final 10%), l-methionine, and sulfur sources (sulfate: MgSO4 or/and thiosulfate: Na2S2O3). Cultures were incubated aerobically by vigorous shaking at 30°C or 37°C. Growth was monitored by measurement of the optical density at 660 nm (OD660). In L-cysteine production experiment, SM1 medium with 30 mM thiosulfate and 30 mM sulfate or only 30 mM thiosulfate was used for the L-cysteine production. L-Cysteine overproducers were precultured in LB (Tet + Cm) at 30°C for 20 hours and the preculture was inoculated into 30 ml of SM1 + sulfur source (Tet + Cm) to set into OD660 of 0.4 in each culture. The culture was cultivated at 30°C for 24–48 h. Isopropyl-1-thio-β-d-galactopyranoside (IPTG; final concentration 0.1 mM) was added to the medium after 6 hours cultivation to overproduce the intended proteins. The pH was adjusted to 7.0 using CaCO3. Growth was measured by absorbance (OD562) of culture broth after appropriate dilution with 0.1 N HCl. E. coli K-12 strain AG1 [recA1 endA1 gyrA96 thi-1 hsdR17 (rK-mK+) supE44 relA1] was transformed with each of the various pCA24N-based plasmids, and then the transformed cells were grown at 30°C in 50 ml of LB medium. When OD660 reached 0.6, IPTG was added to the culture medium to a final concentration 0.1 mM to induce gene expression. After cultivation for 3 h at 30°C, the cells were harvested, suspended in 5 ml of ice-cold buffer A (40 mM imidazole, 0.5 M NaCl, 20 mM Sodiun Phosphate), and broken by sonic oscillation under cooling. After centrifugation (20 min at 18,000 × g), the soluble fraction of the supernatant was purified using Ni sepharose column, His Trap HP(GE Healthcare, Piscataway, NJ) by the procedure recommended by the supplier. His-tagged fusion proteins were applied to the column equilibrated with the same buffer containing 10 mM imidazole. The column was washed with 80 mM imidazole in the same buffer, and proteins were eluted with 0.5 M imidazole, 0.5 M NaCl and 20 mM sodium phosphate in the same buffer. Protein concentrations were determined using a Bio-Rad protein assay kit (Hercules, CA) with bovine serum albumin as the standard protein. Trx and Grx activity was assayed by the procedures as described in[14, 15]. Trxs (Trx1-2) and Grx-like proteins (Grx4 and NrdH) are rereduced by Trx reductase after the reduction of substrates. Grxs (Grx1-3) are also rereduced by glutathione and glutathione reductase. We therefore separately measured the activities of Trxs and Grxs by monitoring the decrease in absorbance of NADPH at 340 nm. The reaction mixture for Grx assay contained the following in a final volume of 0.5 ml; 0.5 mM GSH, 0.16 mM NADPH, 0.1 mg/ml BSA, 5.9 μg/ml glutathione reductase (Sigma-Aldrich, St. Louis, MO) in 0.1 M Tris–HCl (pH 8.0). The disulfide substrate, 50 μM S-sulfocysteine (Sigma-Aldrich), is added to the reaction mixture, leading to the formation of a mixed disulfide between GSH and S-sulfocysteine within 1 min. After the recombinant Grx is added to the reaction mixture, the decrease of NADPH was measured for five minutes. The reaction mixture for Trx assay contained the following in a final volume of 0.5 ml; 0.32 mM NADPH, 20 mM S-sulfocysteine, 0.2 μM thioredoxin reductase in 0.1 M potassium phosphate/2 mM EDTA (pH 7.0). The recombinant Trx was added to the reaction mixture to start the reduction of S-sulfocysteine. The amount of L-cysteine in culture supernatants was determined according to the procedure of Gaitonde. Before adding a Gaitonde reagent (250 mg ninhydrin dissolved in a mixture of 4 ml of HCl and 16 ml of acetic acid), L-cystine in the samples was reduced by incubation with 5 mM dithiothreitol in 100 mM Tris–HCl buffer (pH 8.6) for 10 min. The reaction products were diluted with 99.5% (vol/vol) ethanol prior to measurement of the absorbance at 560 nm. We greatly appreciate H Mori and R Takeuchi (Nara Institute of Science and Technology, Japan) for their helpful discussion and assistance on this work, respectively. We thank Ajinomoto, Co., Inc. (Tokyo, Japan) for providing the strains and plasmids. This work was supported in part by KAKENHI (Grant-in-Aid for Scientific Research) on Priority Areas "Applied Genomics" from the Ministry of Education, Culture, Sports, Science and Technology of Japan and by a grant from Ajinomoto Co., Inc. to H.T. TN, NW, SM and IO carried out the experimental studies. TN, IO and HT wrote the manuscript. IO conceived the project, co-supervised HT, and checked the data. All authors read and approved the final manuscript.